We split our two NHL betting tips last night. The Bruins and Rangers went under the total as New York scored two third-period goals to win 2-1, but we cashed the Over 5 in Los Angeles as the Kings defeated the Red Wings 4-2. 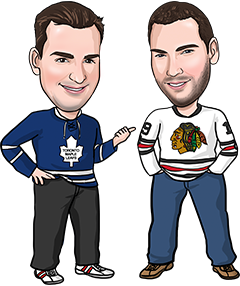 We’re going with both of last year’s Stanley Cup finalists on our NHL tips for tonight’s action, along with a hot team that no one’s really paying attention to. Two teams going in opposite directions. Blackhawks are playing their best hockey of the season, gunning for an 8th straight win, and the Predators are searching for answers with 3 straight losses and 4 wins in their last 13 games. Chicago is also looking to avenge a 5-1 loss in its last meeting with Nashville. With the Hawks 18-5-1 this year at home, -145 looks like a short line here. There’s a lot of optimism in the Tampa dressing room these days. They’re finally close to full health, and they’re coming off two straight OT wins. Now they visit Colorado, where they haven’t won in their last 6 tries, so they should be focused to try and end that streak. The Avalanche got lit up for 6 goals against last time out in Chicago and is below .500 at home, so we like Tampa’s chances of getting the job done tonight. When you factor in expectations and perception, there might not be a hotter team in the NHL these days than the Coyotes. They’re 7-1-2 in their last 10 games and have collected points in 5 straight. They’ve also owned the Oilers during the Dave Tippett era, going 21-2-4 in 27 games. Some trends are meaningless, but that’s one we put stock in because it’s got to be in Edmonton’s head by now. The Oilers are in another funk, losing 5 of their last 7. Even if this one’s close in the third period, we don’t think the young Oilers have enough confidence to get the job done tonight.